The Fifth Annual Uncork the Alleghenies Wine Festival is coming to the Blair County Convention Center March 7th...with wine tastings, food samplings, specialty vendors, a photo booth, silent auction, live entertainment and more. This event will be one you won't want to miss. The first 2,500 people through the door will receive a complimentary reusable shopping bag. This year's event will offer expanded aisle ways, extended session times, as well as hotel and bus packages available with your advance ticket purchase. 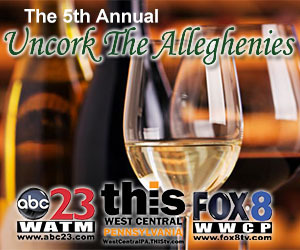 The 5th Annual Uncork the Alleghenies will have wider aisles and one extra hour to enjoy the vendors! VIP Session Times: 5:00 - 10:00 pm (Only 200 tickets available) includes private wine tasting one hour prior to evening session, admission to evening session, wine tastings and free souvenir wine glass, and all entertainment and activities. General Admission Session Times: 12:00 - 4:00 pm and 6:00 - 10:00 pm - includes admission to general session, wine tastings and free souvenir wine glass, and all entertainment and activities. Cost: Advance ticket sales $25 ($30 at the door - day of event) Limited number of tickets available to each session. Designated Driver includes admission to general session and all entertainment and activities (excluding wine tasting). Thank you so much Jill for listing and reminding us about the 5th Annual Uncork the Alleghenies Wine Festival this March 7th, 2015.